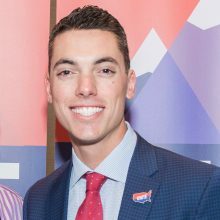 Nick Troiano is a civic entrepreneur based in Denver, CO. He is the Executive Director of Unite America, which aims to elect independent candidates to office in order to bridge the growing partisan divide. Nick is active in leading efforts and supporting organizations that are aimed at strengthening American democracy and tackling our country’s most pressing challenges. Most recently, Nick worked for Change.org on Change Politics – a non-partisan platform that empowers citizens to make informed decisions on Election Day. In 2016, he was named to the “Forbes 30 Under 30” for Law & Policy. Nick ran for the U.S. House of Representatives in 2014 from Pennsylvania’s 10th District and drew national attention as both the youngest candidate and the most successful independent of the cycle, garnering over 22,000 votes. In 2012, Nick co-founded The Can Kicks Back campaign to advocate for bipartisan policies to reduce the national debt and was instrumental in the introduction of the INFORM Act to increase transparency in the federal budget. Previously, he served as National Campus Director for Americans Elect where he organized and supported student groups at over 300 colleges nationwide.